Chili without Beans is full of beef, peppers, tomatoes, and spices—it’s so flavorful and just right for game day or a family night at home! 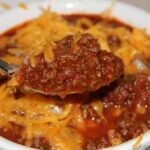 This make-ahead and freezer friendly chili recipe with no beans is great for parties and to store in the freezer for busy weeknights. So, Chili Without Beans, otherwise known as Man Chili…And just what is Man Chili, you ask? Well, it ain’t the chili I grew up eating, that’s for sure. Where do you fall in The Great Chili Debate? I’m in the camp that chili is supposed to have beans, like this Classic Chili Recipe. However, the men in my family determined that they don’t like beans in their chili so I started making them chili without beans, hence the name Man Chili. And I have to admit, this no bean chili is pretty tasty. Lots of peppers and spice, a little tomato and a lot of meat—and you can throw a pot of beans on the side and mix together if you like. **Cook’s Tip: I usually make this chili for a pretty large crowd, so this chili recipe is about a third of what I use. But this makes enough for 6-8 people, depending on how big the appetites are and what you serve with it. As far as equipment, I like to use a large Dutch oven like this one, and if I’m making enough for a big crowd then I use my huge stockpot. You can also make this chili without beans in the slow cooker. See my cooking tips below for instructions. 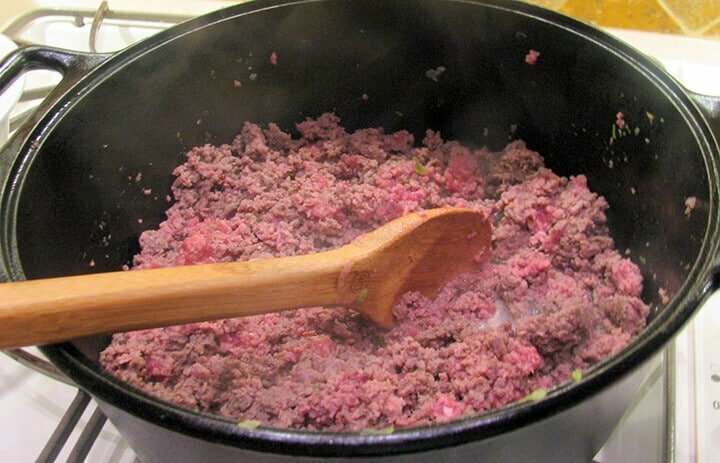 Start with a couple of pounds of sausage, ground chuck, or ground sirloin and brown in a large Dutch oven. **Cook’s Tip: This chili without beans recipe works well in a large stainless steel stockpot or an enameled Dutch oven. Once the meat is browned, remove it to a strainer (and don’t strain into your sink, strain over a bowl) and then add a couple of tablespoons of olive oil or canola oil to the pot. Heat the oil for a minute or so, then add chopped onion, garlic, and peppers to the pot. 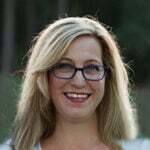 **Cook’s Tip: You can use any combination of chile peppers, depending on how hot you want the chili. I typically use a jalapeño, maybe an Anaheim or serrano, and a chipotle—or maybe 2 jalapenos and one chipotle or whatever I have on hand. Jalapenos and serranos are hotter, so be careful of those. Check out this guide to Chili Pepper Types to help you decide! We like our No Bean Chili pretty spicy! 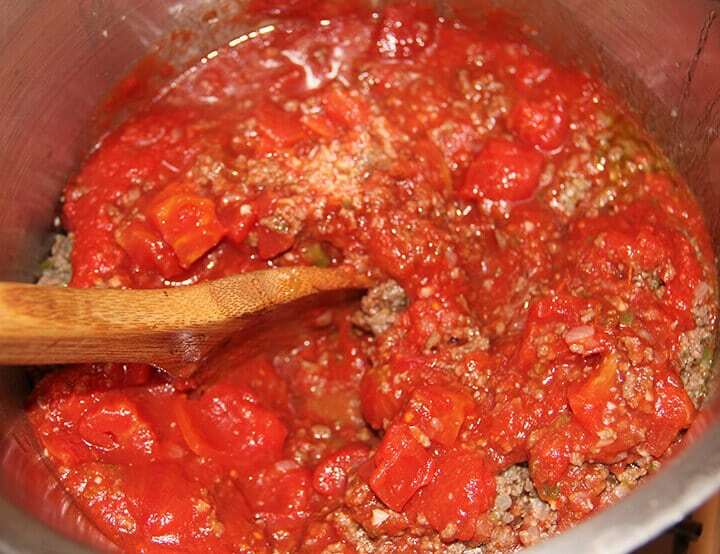 Once the vegetables are soft and just starting to brown a little, put the meat back in the pot and add a can of crushed tomatoes, a can of diced tomatoes, a bottle of good flavored beer, 1 cup of water, and spices. **Cook’s Tip: For seasoning, I use several tablespoons of chili powder, cumin, ancho chili powder, and a little crushed red pepper and cayenne. 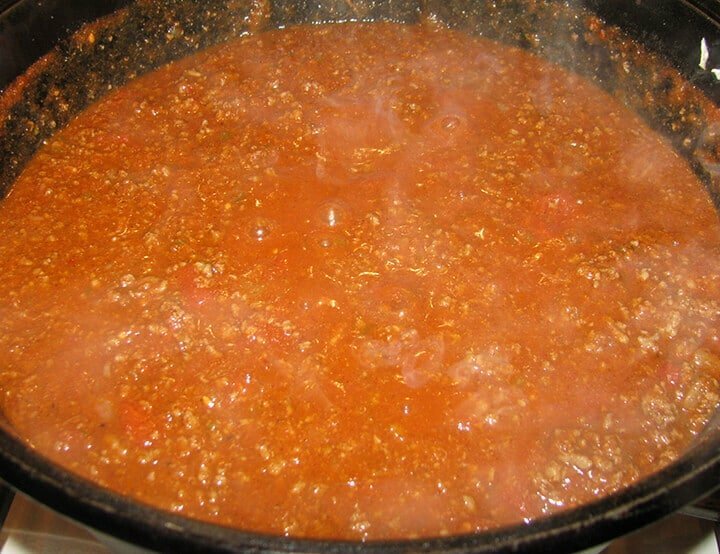 Bring the chili without beans to a boil and then turn down to a simmer. Those chunks of tomato will cook down and blend in and you won’t even know they’re there, but they will add nice flavor. Taste and add salt and pepper and additional seasonings as needed. 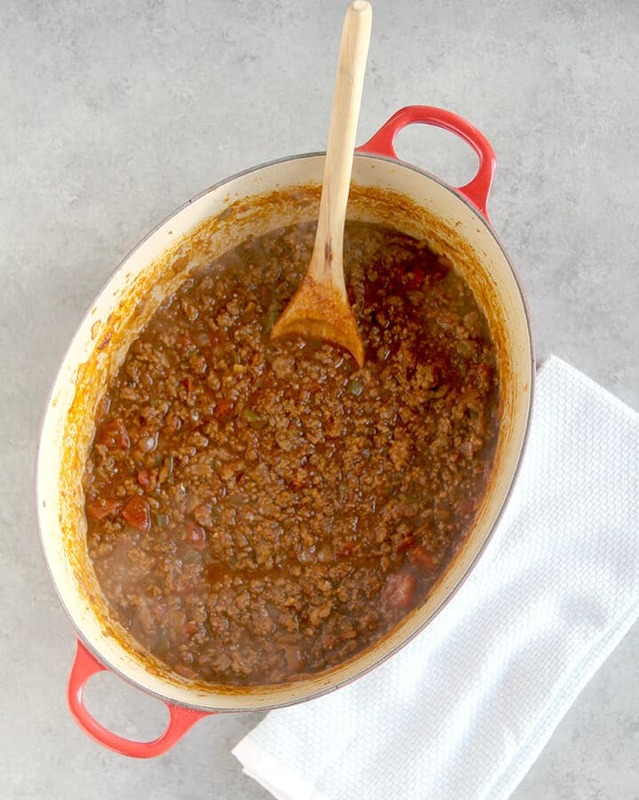 **Cook’s Tip: The chili needs to simmer for at least an hour or two and you can leave it on the stove on low for quite a while, which makes this the perfect party dish. Toppings: Top your no bean chili with grated cheese, sour cream, some chopped green onions, or whatever you like. Serving: Around here we just have cornbread, but you could have a side dish of brussels sprouts or maybe even a kale salad. Slow Cooker: After browning the meat and vegetable, combine those with the other ingredients in a slow cooker and cook on high for 3-4 hours or low for 6-8 hours. Make Ahead: This chili recipe with no beans gets better with age so you can make it several days in advance if you need to. I use these restaurant-style containers to freeze soups and chilis. They’re the perfect size and they’re cheap so if you want to give your chili to a friend you don’t have to worry about losing your expensive storage containers. You can also freeze the no bean chili in gallon-sized freezer bags. This recipe should fill at least 2-3 bags. Allow the chili to cool completely and then fill the bags with chili and then lay the bags flat on a large cookie sheet and place in the freezer. Once frozen, you can store the bags flat or upright. 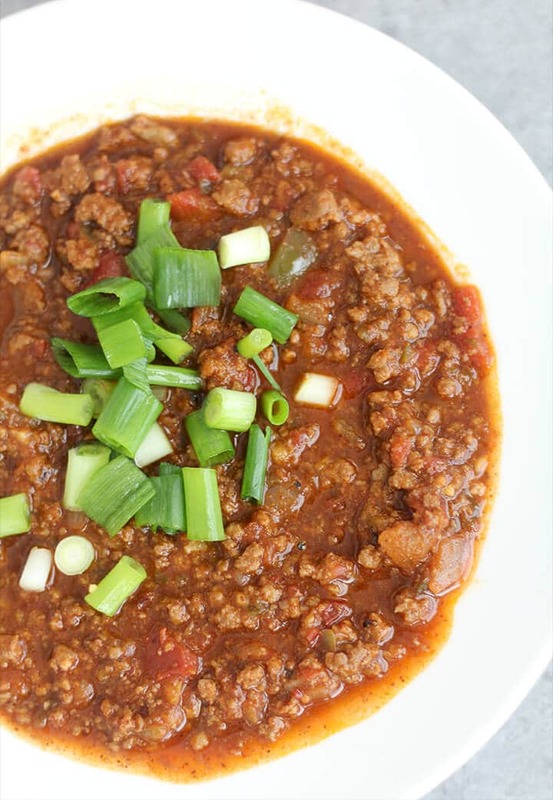 If you’ve tried this Chili without Beans, please rate the recipe and leave me a comment below! Chili without Beans is full of beef, peppers, tomatoes, and spices—it's so flavorful and just right for game day or a chilly night at home! Brown meat in large Dutch oven. Remove to strainer (strain over a bowl, not in the sink). Add olive oil or vegetable oil to the Dutch oven and heat over medium-high heat. When oil is hot, add onions, peppers and garlic and saute over medium heat until vegetables are soft and just starting to brown a little. Add meat back into pot. Add tomatoes, beer, water, and seasonings. Depending on how spicy you like chili, you might want to start with half the seasonings listed and then taste later to see if you want to add more. If it looks a little dry (higher proportion of meat and peppers) then you might want to add another half bottle of beer. Bring chili to a boil and then turn down to a simmer. Cook for at least an hour or two, stirring frequently. Taste halfway through because you might need to add more seasonings. Serve with grated cheese, chopped green onions, sour cream or other toppings. You can easily double or triple the recipe for a large crowd. Use an enameled Dutch oven or large stainless steel stockpot with heavy bottom. Any combination of chile peppers works, depending on how hot you want the chili. I typically use a jalapeño, maybe an Anaheim or serrano, and a chipotle—or maybe 2 jalapenos and one chipotle or whatever I have on hand. Jalapenos and serranos are hotter, so be careful of those. For seasoning, I use several tablespoons of chili powder, cumin, ancho chili powder, and a little crushed red pepper and cayenne. This is a taste-as-you-go recipe! 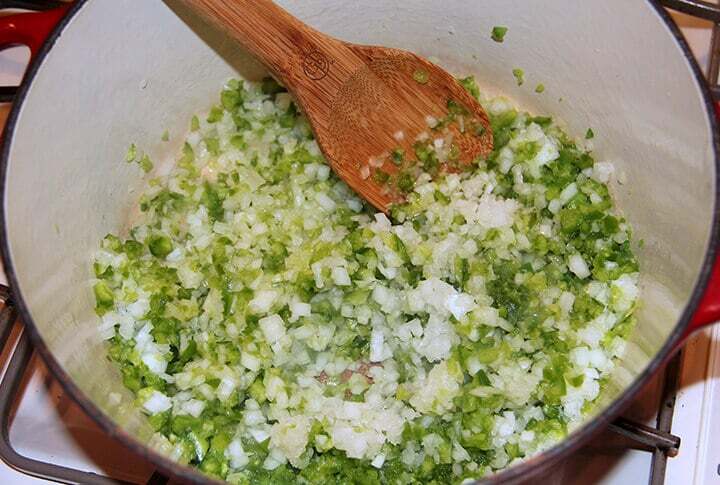 Don't be shy with seasonings but be sure you taste after it's had a while to cook before you start adding more. Serving: Around here we just have cornbread, but you could have a side dish of vegetables or maybe even a salad. Make Ahead: This chili recipe with no beans gets better with age so you can make it several days in advance if you need to. The chili needs to simmer for at least an hour or two and you can leave it on the stove on low for quite a while, which makes this the perfect party dish. Freezer: I use these restaurant-style containers to freeze soups and chilis. They're the perfect size and they're cheap so if you want to give your chili to a friend you don't have to worry about losing your expensive storage containers. You can also freeze the no bean chili in gallon-sized freezer bags. Allow the chili to cool completely and then fill the bags with chili and then lay the bags flat on a large cookie sheet and place in the freezer. Once frozen, you can store the bags flat or upright. Update Notes: This post was originally published September 29, 2011, and on October 11, 2018, was updated with one or more of the following: step-by-step photos, video, updated recipe, new tips. I loved this recipe. Love! The only thing i changed was i swapped the water for beef bone broth. Thanks, Elizabeth! So glad you enjoyed the chili.